"How many observe Christ's birthday! How few, his precepts! O! 'tis easier to keep holidays than commandments." ...there is no God apart from me, a righteous God and a Savior; there is none but me. Turn to me and be saved, all you ends of the earth; for I am God, and there is no other. 4.1 The nature of salvation. In day-to-day living, the passion of our temptations and the frustration of our trials often blurs our vision of the line between right and wrong. What to say and how to act are not always clear, especially in the heat of a stressful moment or sudden conflict. When we lose sight of what to do, it's not because the difference between right and wrong has gotten fuzzier. Right and wrong never stop being clear. Rather, it's our vision that's lost focus. This problem with our moral vision is one more reason why God has given us the Bible. The Bible is the God-given objective truth by which subjective humanity has been commanded to interpret God's will for every situation in life. Paul reminded Timothy of this in writing that the Scriptures are able to make Timothy "wise for salvation". Paul had recognized Timothy to be among the faithful for a long time (1 Tim. 1:2), so Paul was not writing here about Scripture's ability to facilitate conversion (i.e., salvation from the penalty of our sins). He was instead writing about salvation in a different tense. 4.2 The three tenses of salvation. Salvation, as the Bible presents it, has three tenses: past, present, and future. Salvation-past has to do with salvation from the penalty of sin. The moment we first believe and confess Jesus to be Lord, all our sins are forgiven and God's wrath no longer remains on us. Salvation-future has to do with salvation from the presence of sin. When we are finally brought into heaven, there will be no sin there for us to contend with and our salvation will have been completed. Salvation-present has to do with our salvation from the power of sin. After receiving Christ and the promise of eternal life, but before entering the sinlessness of heaven, we remain in a sinful world where we must struggle against the power of sin every day. This means struggling with our temptations and wrong-doings as well as with the compounding consequences of everyone else's temptations and wrong-doings. It is this third tense in which Paul is writing to Timothy. The Scriptures are able to make us wise for salvation from the power of sin by teaching us the godly responses to the various situations in life. Paul finishes this thought to Timothy in writing, "All Scripture is God-breathed and is useful for teaching, rebuking, correcting and training in righteousness, so that the man of God may be thoroughly equipped for every good work" (2 Tim. 3:16 NIV). training in righteousness (how we should act from then on). 4.3 The purposes of God's Word. Another way to categorize the purposes of Scripture are the three ways in which Scripture benefits us in terms of our relationship to God. First, because everyone is born unregenerate, there is a need for each person to be established in a living relationship with God. This is a primary purpose of the Word. Second, like any human relationship, there are things that we need to do in order to maintain the closeness of our relationship with God. Third, especially characteristic of human love relationships, there are things we can do, and things that God is doing, which help us grow closer and closer together in this relationship. Let's look at these purposes in more detail. Consequently, faith comes from hearing the message, and the message is heard through the word of Christ" (Rom. 10:17 NIV). In addition to the purposes of initial regeneration and maintaining the closeness of our relationship with God, the Word exists to help us to mature and grow in that relationship. This means that through his Word, God reveals himself to us. Thus the continual exposure to God through prayer, worship, and the Word washes us clean like the polishing of a dirty mirror. The more we are exposed to the washing of the Word, the better we are able to reflect God's characteristics and essential image. For everything that was written in the past was written to teach us, so that through endurance and the encouragement of the Scriptures we might have hope. (Rom. 15:4 NIV. See also Psa. 119:28, 45). God's possession of authority was presented in chapter two, and it's imputation to the Bible in chapter three. 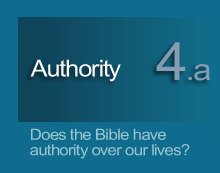 Now we consider how God's authority, via the Bible, has been set up to affect our lives. First in terms of salvation from sin to eternal life with God, second in terms of daily living, and third concerning that crescendo moment when we meet the Lord face to face.